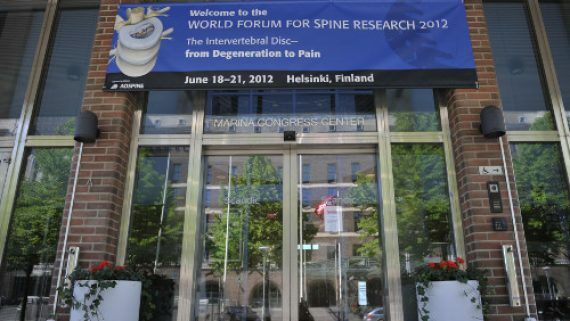 KKT International will be taking center stage at the World Forum for Spine Research in Helsinki, Finland. This prestigious event will bring together top experts in the field of the intervertebral disc to share their knowledge on the rapid advances in basic, translational, and clinical research. Thirty top speakers from around the world will lecture at the event and they have been chosen on the basis of their recent contributions to the field – they represent the top 70% of all researchers on the intervertebral disc. The keynote lecture will be given by world renown biomechanics expert and host of the hit T.V. show “Deadliest Warriors”, Dr. Geoff Desmoulin, PhD. The presentation, titled “Non-invasive Intervention Corrects Biomechanics and Up-Regulates Disc Genes for Long-Term Spinal Health” will focus primarily on the breakthrough research KKT International has conducted on the ability of Quantum Waves to restore the spine and stop or even reverse disc degeneration. The promise of a technology that can reverse disc degeneration is especially significant, since most doctors consider disc degeneration to be a normal part of aging. This has created a buzz within the scientific community, since it not only challenges long held beliefs about the spine, but it has the potential to forge a completely new direction in spinal research, a field which has remained stagnant for decades. KKT International has clearly set a new direction for spine treatment, as doctors attending the event will be adopting a radically different and superior approach to treating patients with a variety of spinal conditions. As scientists from around the world are only beginning to discover KKT’s breakthrough in treatment, thousands of patients have already seen the benefits of Qauntum Waves first hand. KKT International has already established centers which utilize their device in over 10 countries around the globe. Many patients have been flying great distances to KKT International Spine Centers in the hopes to relieve the spinal pain they have been suffering from for many years. To fulfill the needs of these patients, KKT International is currently in the process of establishing more clinics. Please check their website www.kktspine.com to find out if they have a center near you.